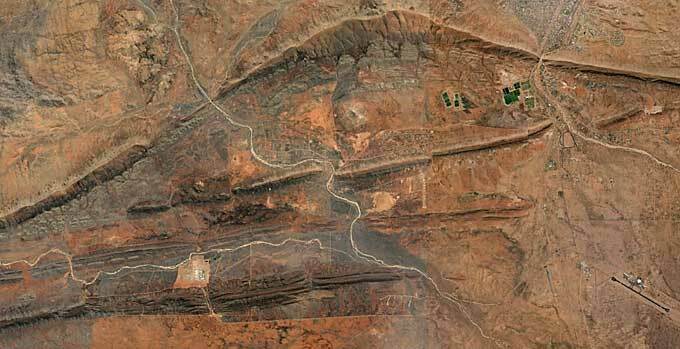 One of the creeks recharging the Mereenie basin, from which Alice Springs draws most of its water, is seen entering this Google Earth photo from the north-west (top left). A tributary, Laura Creek, joins it from the west after flowing past Pine Gap (bottom left). The main part of the town is in the top-right corner of the picture, the airport, bottom-right. One of the hottest Northern Territory issues is one of the hardest about which to get useful information: water. Almost the entire supply for Alice Springs is coming underground basins, principally from Mereenie, which is being depleted in excess of its recharge. Cr Steve Brown has traded blows about the situation in Central Australia with Jimmy Cocking, CEO of the Arid Lands Environment Centre (ALEC). During this dispute eminent Alice Springs based water expert, John Childs, retired from the NT public service, gave his views about options for the town. Sparks were also flying over the allocation to the farm at Mataranka of the CLP candidate in Lingiari, Tina MacFarlane, in the lead-up to the last Federal elections. That still gets a regular mention and is set to bubble up again some time soon. • How much water do we know Alice Springs has available? • How much more water can we reliably expect will be available to Alice Springs? • What is the recharge – the replenishment of the underground basins from rainfall? • How much of that recharge can we responsibly use? The results of our enquiries are dismal: The National Water Commission (NWC) – this year’s budget $8.3m – does not have any of the answers. Neither can it say whether there are nationally or internationally accepted norms for the use of recharge, and what percentage should stay in the ground for environmental purposes, as is argued for by David Morris, principal lawyer and EO of the Environmental Defender’s Office in the NT. We spoke with Mr Morris soon after he visited ALEC recently. He says his understanding of the norm is to use 20% of the recharge, which, he says, is what Alice Springs is using at the moment. That should not be increased. He says some experts claim it is too much. Mr Morris stresses he is a lawyer, not a scientist. It’s a measure of the dismal shortage of information that Mr Morris’ belief is so far off the mark: the fact that the water level in the basin from which Alice Springs draws is dropping, shows beyond doubt that we are using more than 100% of the recharge. The NWC spokesperson referred us to the National Centre for Groundwater and Training (NCGT) in Adelaide – budget of $60m over five years – which turned out to be as unrevealing as the NWC itself. Says a NCGT spokesman: “Unfortunately we are unable to supply a generalised recharge percentage figure as requested. “While it may seem like a simple request, there are many factors influencing aquifer recharge across different areas of Australia such as local geology, rainfall, recharge zones and time speeds and differences in regional policies. “Additionally, Australia has many different temperate zones which complicates things further (e.g. the Great Artesian Basin recharges from tropical QLD but discharges in the arid outback). All this, of course, is of little help for the Central Australian community which, given that half of the landmass is Aboriginal owned, is increasingly seeing employment in agriculture – obviously needing water – as vital to diminish Indigenous disadvantage and strife. The NWC has no regulatory powers and is merely an advisory body. The bi-annual assessment in 2011 for COAG of the NWC and its National Water Initiative (NWI) says they still have a long way to go. One can’t help wondering whether Tuesday’s federal Budget will take a different view. The NWI is “a commitment by all state and territory governments [for] managing surface water and groundwater resources for rural and urban use that optimises economic, social and environmental outcomes”. That is not reflected in anything the NWC nor the NCGT can contribute, by way of advice or research, to Central Australia, resolving “overallocation and overuse, clear assignment of the risks associated with changes in future water availability, effective water accounting, open water markets”. The assessment says in the Northern Territory, under the Water Act 1992, “mining activity is exempt from all water licence and permit provisions, except for the requirement for a licence to dispose of waste underground by means of a bore outside the mining site. “Mining is thus effectively outside the water entitlement and water planning frameworks.” That still needs to change, says the assessment. Further, it seems to open a Pandora’s Box by urging involvement of traditional owners in the water planning. It says: “There has been increased recognition of the cultural values of water resources and advances in the engagement of Indigenous Australians in water management. “Most jurisdictions have established consultative mechanisms intended to engage Indigenous people in water planning. For our own part, the Commission has established the First Peoples’ Water Engagement Council. “Nevertheless, the full intent of the NWI parties’ commitments on Indigenous interests in water has not yet been achieved. The point where the disagreeing parties are as one is that much better knowledge of the resource is the key. And that means spending money on drilling holes – hundreds of them – and replacing guess work with facts about what lies underneath. Says Mr Morris: “I’m not sure there is a complete understanding of the groundwater resources and what they can sustain in terms of mining and agricultural development going forward. “My understanding is there is still much to be learned about groundwater resources in Central Australia. As predicted in this report, the National Water Commission and the National Center for Groundwater Research and Training were axed in the Federal Budget. The commission will cease operating at the end of the year, and the center, at the end of June. @ Steve Brown. Posted May 15, 2014 at 5:54 pm. Environmental outcomes are determined by the culture of the user and how land is used, e.g., mining, pastoralism, tourism, agriculture. There is sometimes difference on how this is best achieved – cotton versus kutchera or buffel – hence the NWI’s approach to negotiation. If this seems bureaucratic or scientific, then perhaps it’s an extreme to the old days when radioactive waste was left lying around, or unregulated fracking, or open-cut coal mines in the Hunter, Gladstone harbour and nickel refineries leaking chemicals into fishing grounds, stuff like that. What utter garbage Russell! There is now supposedly an environmental difference between Aboriginal and non Aboriginal land? Not that I can see! It doesn’t matter who owns the land, they are entitled to negotiate water extraction! As for culture, everybody has culture, how does that have anything to do with water rights? The answer is that it doesn’t. What happens is that the usual parasitic patronisers of Aboriginal people trot culture and environmental differences out as if that demonstrates some kind of need for their interference. Condescending bureaucratic concern with an eye firmly fixed on the funding stream! These are the true usurpers Russell! Creating division, making excuses to inflict their supposed expertise, patronising arms round the shoulders while making paternalistic decisions for Aboriginal People. Nobody gets paid to negotiate my water rights. How many wage packets do you think there are negotiating Aboriginal water rights? The world will be a much better place when Aboriginal people are treated just exactly the same as everybody else when we all realise that Aboriginal people don’t require the input of every blow-in dead-beat drop-out who has the astounding audacity to presume superiority. As a born and bred Centralian who has spent his entire life with Aboriginal people I am sick of being lectured about Aboriginal culture by disaffected white blow-ins, often with the word doctor in front of their name which of course means that they know more about being Aboriginal and especially their culture than Aboriginal people do themselves. It’s time we pushed these people out of our lives put them on the garbage heap where they belong, because Russell, they are the true usurpers. The usurpers of other people’s humanity and individuality, along with their right to be recognised and treated as equal Australian citizens. Regarding your comment about Indigenous water rights. While Indigenous interests should not be seen as separate or different to the rest of the community when it comes to water, the reality is that there are cultural and environmental differences that need to be explored in negotiation. It appears that the NWI have grasped the fact that Indigenous groups have rights to different portions of land in Central Australia and need to be respected in negotiation. Historically, there is an underlying legacy of usurpation which raises its ugly head in many ways on a daily basis, not least in the pressures put on Indigenous peoples to conform. And I do mean pressure. You cannot respect what you don’t or don’t want to know. This is a common attitude among non-Indigenous Australians who often have a “know-it-all” and graceless attitude to the bush, to which the NWI appear to be cognitive. Yes, Steve, racism takes many forms. You often state the obvious, but when challenged to deconstruct your opinions, you defer. I’d like to see you try to get some of your Big Picture ideas through the Senate. Perhaps, you could take a leaf out of Clive Palmer’s book. He seems to be shedding some of his bluster. The most recent controversial issue, the water cap, wasn’t controversial in itself or rather it shouldn’t have been if some pretty low level thinking hadn’t also concluded that the cap should also apply to the growth of our town and any possible industry development. Perhaps if we use different terms, those who seek to use any argument they can to frustrate growth in our region will find it a little more difficult to turn it into anti growth propaganda. Of course there is a maximum sustainable yield from the Mereenie aquifer which you can describe as a “cap” on the amount you are going to take out. We don’t actually know what that amount is, by the way, and the figure that has been in use is simply a guess! An extremely conservative guess! Applying to just a tiny portion of the entire aquifer. What the previous argument didn’t tell you is that there are also many alternatives for supplying water to our town. There are other aquifers and just like the rest of the world, we can build dams. There is the Great Artesian Basin not very far away and we can run pipelines all the way from the north if necessary, opening up the vast spaces of Central Australia to agriculture along the way. Yes, of course there, is a limit on what can be taken from Mereenie. That is why research into its true capacity is so important, especially into the great unknown recharge, as it is of paramount importance to sustainable yield. This is not acknowledged in the present calculations. However, even without recharge, the field is calculated to be able to deliver considerably larger quantities than we presently use for 300 to 400 years. What is really important to note is that our town is not in any way constrained by that limit. Reaching it simply forces us to explore other opportunities. And of course a smart Government would start doing that long before it was absolutely necessary. But don’t panic, we do have at least a couple of hundred years before that becomes urgent. The real shame in all of this is that because we are guessing and being so conservative about it, we are possibly and in fact very likely missing enormous opportunities for development in agriculture in the meantime. A further point arising from this article are Indigenous water rights. Aboriginals are people, Australian citizens. Their interests are not in any way separate or different to the rest of the community. They are one and the same! Indigenous water rights do not exist as a separate issue. Attempts to make it so are racist. We absolutely must end further segregation amongst fellow Australians and we absolutely must stop using the Aboriginal name to justify the setting up of additional parasitic agencies that claim “Indigenous Water Rights” as some kind of separate issue. How do water rights vary between a white farmer or station owner and an Aboriginal person? The same goes for fishing, boating, drinking, gardening any use you can think of? The answer is that they do not! We are all Australians, equally! Attempts to interfere with that equality are attempts to lessen one party or another’s equality! Racism takes many forms. This is one of them. My understanding was that recharge on average was estimated to be 10% of annual extraction. Thus explaining why the resource while large was being depleted. In an attempt to apply the “precautionary principle” a cap on use was put in place. This cap has recently been abandoned by the current authorities without any clear justification being provided for that change. A lively debate can be expected.